Australia’s Lucapa Diamond (ASX:LOM) has found an 89-carat yellow diamond at its 70%-owned Mothae mine in Lesotho during the current bulk sampling program. The company’s managing director, Stephen Wetherall, said the recovery of such a large diamond so early in the bulk sampling program provided further proof that, just like the neighbouring Letšeng mine, Mothae is another source of large diamonds. Lucapa believes recovering such a large gemstone early in the bulk sampling program proves Mothae is a source of big diamonds. 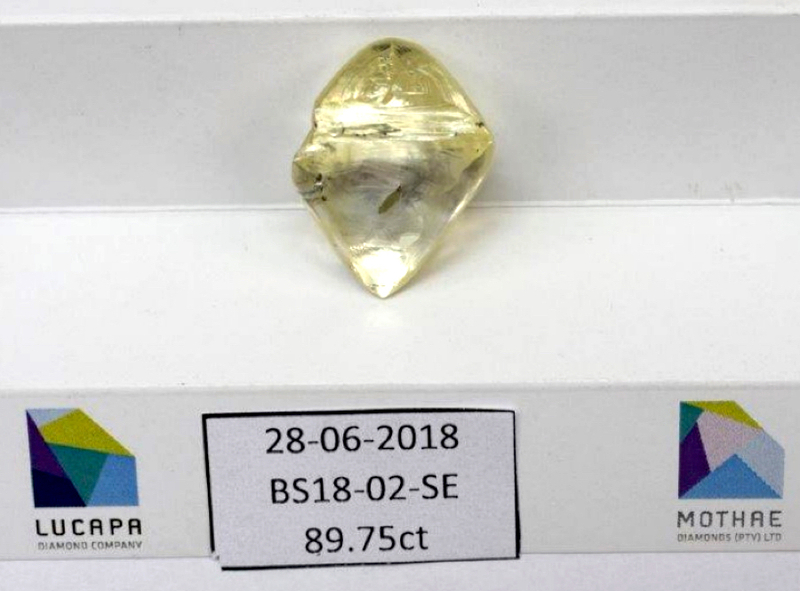 “Having recently recovered a 25-carat yellow diamond from the previously untested neck zone in our bulk sampling program, we are tremendously encouraged that this 89-carat diamond was recovered from the south-east zone, an area of the Mothae kimberlite pipe where there has been very limited historical testing,” Wetherall said in the statement. The ongoing bulk sampling programme, Lucapa said, is designed to expand and improve the current Mothae resource by processing areas of the kimberlite pipe either not included in the resource or where the company believes there has been significant historical sampling. It also noted that construction of a new 150 tonne-per-hour commercial diamond plant continues on schedule for commissioning in the second half of 2018. It’s been a good year for Lucapa so far, with the company fetching $1.7 million in March from selling findings from its prolific Lulo mine in Angola, which recently yielded a 46-carat pink stone, the largest coloured gem-quality rock ever recovered in that country. The Mothae project is located within 5 km of Gem Diamonds' (LON:GEMD) Letšeng mine, the world’s highest dollar per carat kimberlite diamond operation, which in January yielded a 910-carat rock. It was the fifth biggest gem-quality diamond ever found.